Sometimes you toil away for years before getting any kind of acknowledgement that readers like your work. So when it does happen, it is hard not to feel a sense of achievement and relief! Achievement in that someone you’ve never met tells you they like what you write. Relief that you haven’t just been wasting your time writing stories and novels. 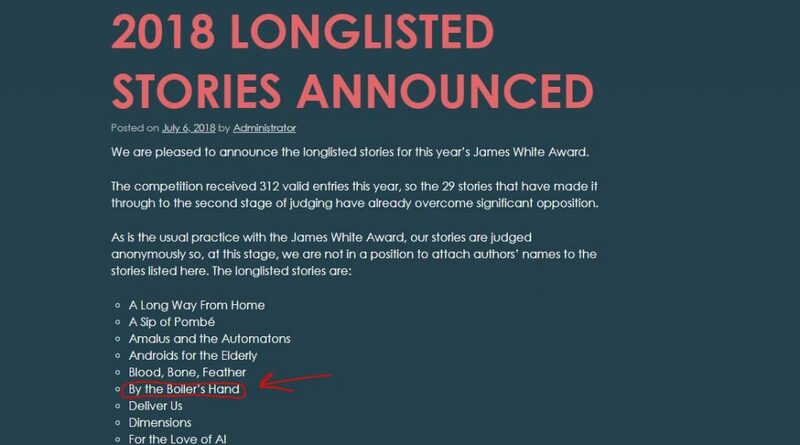 I found out this month that my Science Fiction short ‘By the Boiler’s Hand’ made the 2018 Longlist of the James White Award. This award was set up in the memory of James White, one of Ireland’s most successful science fiction writers. Aimed towards encouraging new writers, the award is sponsored by ‘Interzone‘ the UKs leading science fiction magazine and the British Science Fiction Association. I didn’t make the final 6 but to make the final 29 out of over 300 entries is an achievement in my book and means I am getting closer to finding my readers.